Dixie Lily Yellow Corn Grits – Gluten Free! Enriched yellow corn grits (niacin, reduced iron, thiamine mononitrate, riboflavin). 1. Stir grits and salt into boiling water; return to boil. 2. Cover; reduce heat to low. 3. Cook 3-5 minutes, stirring occasionaly. 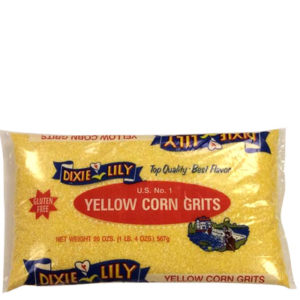 Dixie Lily Yellow Corn Grits are the like the old-fashioned Grits, yet they cook in three to five minutes! This product’s ingredients are grown, sown, milled and packaged in the USA. This is a Gluten Free product. Just a quick question about the gluten free status. Are the grits free from cross contamination in a separate facility and safe for individuals with Celiac Disease? Yes they are certified ” gluten free”! Are the grits free of GMOs? Are your grits processed in a plant that is free from cross contamination with soy/dairy/peanuts/tree nuts? Thank you so much for contacting us. Yes, our yellow grits are processed in a plant that is free from cross contamination with soy/dairy/peanuts/tree nuts. We hope this helps and we appreciate your business. Is there any Potassium or Phosphorus in you Yellow Corn Grits? Thank you so much for contacting us. Our yellow corn grits are enriched. They do contain both Potassium and Phosphorus. We hope this helps and we appreciate your business. Are these yellow corn grits the same as polenta? If not, can I add cornmeal to the yellow corn grits and substitute for polenta in my receipt? Thank you so much for contacting us. You can certainly try our yellow corn grits for your polenta recipe. They are not stone ground but they should work fine. Please let us know how your recipe turns out. We appreciate your business and we hope this helps.